An app that allows farmers to identify pests and diseases using their mobile phones and provides remedial measures is the latest addition to using modern digital tools to benefit smallholder farmers. Currently, the database has over 60,000 photographs and covers 30 crops in India, 60 crops worldwide and has prescriptions for over 200 crop diseases. Every time a farmer uploads a photograph for diagnosis it will be time marked and georeferenced. Hence, the database also facilitates pest and disease outbreak monitoring and can send early warning messages for specific locations. Working together with the developers of the app – Progressive Environmental & Agricultural Technologies (PEAT) – ICRISAT aims to build a database of pest and disease images and content for its six mandate crops. The app can be downloaded on any Android-based mobile device. 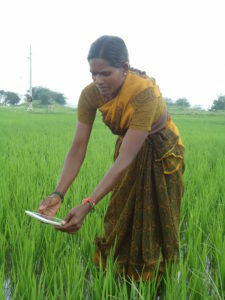 For farmers without a smart phone an extension worker or farm facilitator or progressive farmer equipped with a tablet or smart phone can be the mediator. To overcome connectivity issues, photographs can be taken and later uploaded when internet connectivity is available. “ICRISAT-ICM (Integrated Crop Management) team is actively working with PEAT and providing technical support to capture good quality images of the diseases and pests of ICRISAT mandate crops. We have now captured the major diseases of pigeonpea such as Fusarium wilt, Sterility mosaic disease and Phytophthora blight. Additionally, ICM will also provide solutions for mitigating or eliminating pests and diseases for our mandate crops to ensure sustainable agriculture for smallholder farmers,” said Dr Mamta Sharma, Theme Leader – Integrated Crop Management, Asia Program. Mr Alexander Kennepohl, in-charge of Plant Pathology and Data at PEAT, is of the view that introducing farmers to new technology will help them understand that a mobile is not just a communication tool but an important agriculture tool of the future. In fact, the app partly takes on the role of an agriculture extension worker. Cases where a farmer cannot identify the disease are rare and in such cases farmers can always contact the extension agent or get in touch with PEAT. Efforts to regionalize the content are also in the pipeline. Ms Charlotte Schumann, Knowledge Management, PEAT, said that as part of a pilot project in Telangana, India, they are working towards delivering content in Telugu by end of 2016, and later work on other Indian and African languages. She said they are also transforming the content of the app into icons to help people with limited literacy.